There were 13 posts published in July 2008 (this is page 1 of 2). Looks like AOL Weblogs may be in trouble. Under the AOL umbrella are two news sites of fairly large import to this blog’s readership: Massively and WoW Insider. In probably an entirely unrelated development, Michael Zenke of Massively is LFG. Most visitors to the North Pole head south next. Rumors have been flying around the intertubes all day about Flagship Studios, Hanbitsoft, Hellgate: London and Mythos – here’s probably the most complete recap. What it looks like happened was that Flagship put up the rights to its intellectual property as collateral on loans for operating expenses; and when money got tight, Flagship collapsed to the point that most of its employees were laid off, and (probably not coincidentally) those rights were foreclosed on. Flagship and Hanbitsoft (the distributor of Hellgate in Korea, the area it was most popular in) are currently dueling very publically via press releases (a sure sign that more discreet negotiations have completely fallen apart). It’s a mess, especially for the players most invested in what was promised to be something akin to a massively multiplayer Diablo. And Mythos (the “side project” by Flagship which has consistently gotten better buzz and reviews than its er, flagship title), under heavy development by Flagship’s Seattle studio, will hopefully survive the Battle of Duelling Legal Press Releases. Crowds in Arkansas came for the lure of cage fighting and $1 beer, but police say what they got instead was men ripping each others’ clothes off and kissing. And what’s more, they’re sending me email. On July 6th, 2008 Nodiatis, a new online multiplayer RPG went live. It is not your ordinary carebear RPG with cookie cutter class builds, goofy graphics, and amenities for the weak. 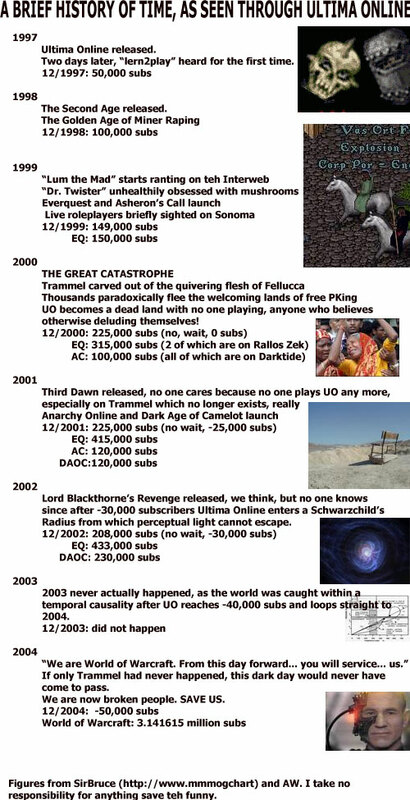 If you don’t know the history of Glitchless… um… don’t ask. Google Lively: The Last Virtual World You’ll Ever Desire. Complete with microtransactions! I expected someone to launch a Second Life competitor this year. I didn’t expect it to be the largest Internet company on the planet. I wonder if Brazilians will take it over. Real anarchists totally drop out of school. Real anarchists know Creative Commons licenses are totally tools of the Man. Real anarchists don’t believe in mp3s. Real anarchists aren’t down with stolen credit cards. Real anarchists believe the Internet should be the domain of “misguided historians and other archeologists of the cursed graveyards of the past“. Real anarchists use Apple Safari. I couldn’t make any of this up. An online game manager recalled that he once received at the company a gamer who had money but no patience. This gamer came with an inquiry: could he simply pay to purchase high-level equipment? Everyone at the company had a good chuckle at that. Now, the manager sighs regretfully: they did not realize that the gamer represented an immense business opportunity. ZT Online, on the other hand, saw it and achieved success. Nope. I couldn’t make this up at all. The game is the brainchild of Shi Yuzhu (史玉柱), an entrepreneur who struck it rich marketing a vitamin tonic called Naobaijin. No, really, I am totally not this creative at all. For every Western MMO pundit who’s complained about how MMOs use variable level reinforcement or play on the gambling impulse to keep players literally addicted… no. They don’t do that. Because these guys do. And now you can see the difference. “Gambling” means “opening the treasure chest.” Gamers can buy keys and chests from the system for cheap: one yuan per set. When the key is applied to the chest, the screen will display a glittering chest opening. All kinds of materials and equipment spin inside the chest like the drums on a slot machine as the wheel of light spins. Where it stops indicates what you’ve won. Chests will frequently contain the high-class equipment that gamers desire, but the spinning light wheel always passes over them. This system was the most diligent gaming system Lu Yang had encountered: it kept people’s hands full with its frequent updates. “You spend money for a sense of security, or you save money and get bullied,” said Lu Yang. “Take one day offline, and you feel like you’ve been left behind. It’s really tiring.” She felt that she was a donkey being led onward by a carrot; there was always some strong “power” before her beckoning her onward, but there was no end to the long journey. And she gradually came to abhor the animosity that permeated the game. RMB gamers who held a grudge wanted to fight to the finish over every little thing. They constantly fought over control of NPCs, assaulted each other’s faction heads, and ceaselessly attacked their opponents’ caravans. In the PK arena they delighted in slaying their enemies. They even saw the top position in the chest rankings as a goal to be taken. The system continued to update and new ruling techniques emerged without end. Even on the traditional monster-slaying missions, the system moved to allow clans to seize the power to kill a boss from each other. As the ruler of a kingdom, Lu Yang had to lead her troops; if she faltered, some infuriated subordinate was sure to complain. This is the second most popular MMO in China. World of Warcraft is #3. Imagine if World of Warcraft did this. Imagine if World of Warcraft had the money from doing this. Imagine if someone wrote a news story about it. Imagine if Blizzard decided to shut it down. One of the aphorisms I like to toss around when doing stand-up pontificating (it’s like stand-up comedy, but usually less funny) is that in MMOs, Asia is about five years ahead of the West. Now we’ve got the cables. We’ve got talk radio. We’ve got the bloggers. I hate the bloggers. We’ve got all kinds of sources of information.